This dessert may seem old-fashioned, but it never goes out of style. We have made this crisp countless times, and it’s always a smashing success. It’s one of those desserts we prepare when we’re in a pinch, without a recipe. We just remember 5 apples, some maple syrup, and spice for the filling, and “1, 1, 1”—1 stick butter, 1 cup coconut sugar, and 1 cup GF/ Paleo flour for the topping. Then we finish it off with a spoonful of oats. Using this quick, foolproof formula, you can turn out a delicious dessert anytime, anywhere. To make the filling: Combine the apples, maple syrup, lemon juice, contents vanilla bean if using, vanilla extract, cinnamon, nutmeg, and salt in an 8-inch square glass baking dish and mix well. Set aside. To make the streusel topping: Melt the butter in a medium saucepan over medium heat. Remove from the heat, and stir in the coconut sugar and salt. Add the flour and oatmeal and stir until just incorporated. Do not overwork. Crumble the mixture evenly over the apple filling. (If your kitchen is warm and humid, the mixture may resemble cookie dough. That is OK. Simply crumble the pieces over the apples.) Put the baking dish on a baking sheet and bake until the topping is golden brown and the filling is bubbling, 50 to 60 minutes. (Check the oven after about 30-40 minutes. (Some apples are juicier than others. I add a little water or apple juice to the apples if they seem dry. Also, it may be necessary to cover the crumble loosely with foil to prevent over browning). Do-Ahead: Prepare the apple filling and the streusel topping 6 to 8 hours in advance, but do not crumble the topping over the apple filling until you are ready to bake. Refrigerate the filling and topping separately. 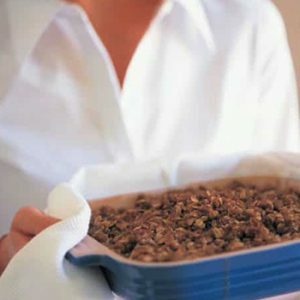 When ready to bake, crumble the topping over the filling and proceed as directed.